Stumped about what to get someone for a wedding, birthday or shower present? 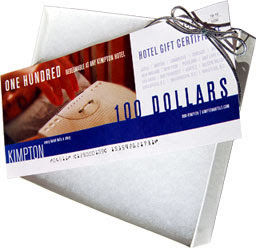 Let me offer this tip: Hotel gift certificates. I just bought some from Kimpton, good for any of their boutique hotels all over the US. Very cool. Gift Vouchers are always a good choice. People seem to have just about all they need, so presents are always tricky. They can either use the gift voucher or redeem it. So the lucky couple will actually use your gift.